Even a simple lunch meeting can be a challenge for David Moises Ibarra. Zooming around campus on his scooter usually poses no problem, give or take the occasional bump in the road or the careless pedestrian. But buildings are another story. Even an elevator can become an obstacle, especially when you can’t fit in one. 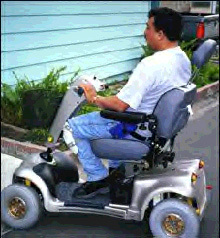 David drives a platinum four-wheeled scooter with a large seat known as a Panther. The device looks more like a minitractor. It’s not easy for David to back up his vehicle, as every movement can be painstakingly difficult. Still, he tried to ease in his vehicle three or four times, but the doors could not close behind him. Finally he was directed to the service elevator located behind the building, where trucks bring in food and supplies for the Titan Student Union. He entered the building’s back door, not realizing the elevator had outside access and hit reverse, his scooter began beeping like a forklift. Alarmed, a few people jumped up and popped their heads out of their offices. Upon seeing David they apologized, and said the hallway’s smoke alarm had the same beeping tone. It wasn’t their fault. Difficult situations are common for someone with cerebral palsy. Ibarra said that he has gotten stuck in public elevators, such as those at the mall, before. Ibarra has not always had cerebral palsy. He was healthy until something went wrong at his birth. During a traumatic delivery, the supply of oxygen was cut off from his brain and caused permanent and severe injury. Cerebral palsy is a broad term for brain damage suffered close to or during birth that permanently affects motor skills. As with other brain injuries, full recovery is not possible. Two out of 1000 individuals in the United States have cerebral palsy. The disease oftentimes causes speech disorders and clubfoot, a condition in which the foot is twisted into an abnormal position that makes walking difficult or impossible. Despite his illness, Ibarra is, in many ways, a normal college student. Though he cannot feed himself or tie his own shoes, he is proud that he can bathe and dress himself, and that he owns his own motor home. He has a passion for baseball, especially for the Dodgers, and wishes he could play. Like most college students, Ibarra works part time for extra money. On weekends he goes to a local nightclub and sells candy. He said the extra cash helps him feel more independant. Thirty-year-old Ibarra stands at about 5 feet 8 inches though usually you will see him only sitting. He is in many ways the typical college student –concerned about his appearance, passionate about sports, living on his own, and becoming steadily becoming more and more independent, though in a way most people would never dream of having to. Ibarra has clean-cut dark hair, olive skin, and smiling eyes set behind a chiseled nose. A trimmed mustache and small goatee surround his genuine, thoughtful smile. Up close it’s almost easy to overlook his bent hands and callused knuckles and the large gray knee pads he wears to crawl around his motor home, which cannot fit his scooter. Ibarra has high hopes for the future and recently received a bachelor’s degree in human development with a minor in Chicano studies from Cal State University, Fullerton. He held a high grade-point average and was well-known and liked on campus. Despite his strained, slow speech, Ibarra expresses himself well and is fluent in both English and Spanish. Still, perhaps because of his speech, or because of his arm gestures, Ibarra is oftentimes incorrectly judged. Ibarra was born in Mazatlan, Mexico and moved to the United States with his parents at the age of 4, in their search for a better life. He is the oldest of four. Ibarra holds the will to succeed, thanking God and his mother for giving him the confidence to overcome his great personal difficulty. Natalia Ibarra, David’s mother lives in the motor home next door to her son and feels that she has been blessed to have such a great person in her life. Everyone who knows Ibarra seems to have nice things to say about him. “David is a great guy with a great sense of humor. He is sincere and straightforward. He doesn’t try to compensate, he just is who he is,” Jeanne Crawford of the Disabled Student’s Center, said. Ibarra knows his life could have turned out differently if not for his drive and his desire to succeed. David is a hero because he is able to rise above the difficulty of his physical condition with constant determination. He is a hero because he has not let life get him down, but lives each day in the best way that he can, accomplishing so much and touching so many lives along the way. He is a hero because despite how he is often looked at by curious or even ill-intentioned strangers, or how he is sometimes treated, he always has a smile and a kind word to offer. He is a hero because of all that he has accomplished so far, and all that he is sure to accomplish in the future. David is a hero because he has beat the odds and has scootered his way into so many hearts with his intelligence, perseverance, strength, kindness, and genuineness. Though he may not posses the ability to walk, or to move his arm properly, or to speak without straining –he possesses a multitude of riches which our world needs today.